Is TLK A Good Stock To Buy? Perusahaan Perseroan (Persero) PT Telekomunikasi Indonesia Tbk (NYSE:TLK) has seen an increase in support from the world’s most elite money managers of late. Our calculations also showed that TLK isn’t among the 30 most popular stocks among hedge funds. Let’s take a peek at the new hedge fund action encompassing Perusahaan Perseroan (Persero) PT Telekomunikasi Indonesia Tbk (NYSE:TLK). What have hedge funds been doing with Perusahaan Perseroan (Persero) PT Telekomunikasi Indonesia Tbk (NYSE:TLK)? 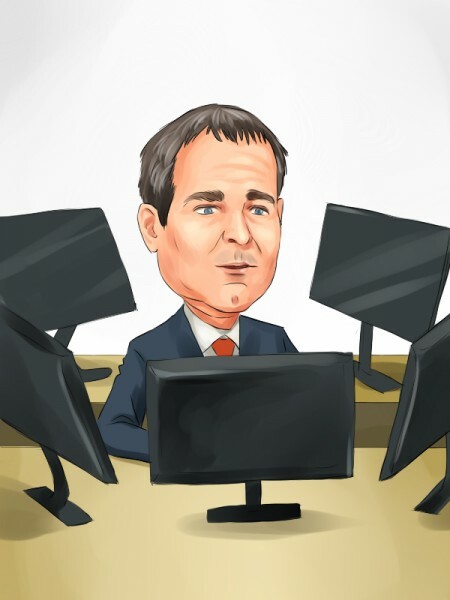 At the end of the fourth quarter, a total of 6 of the hedge funds tracked by Insider Monkey were bullish on this stock, a change of 50% from the previous quarter. 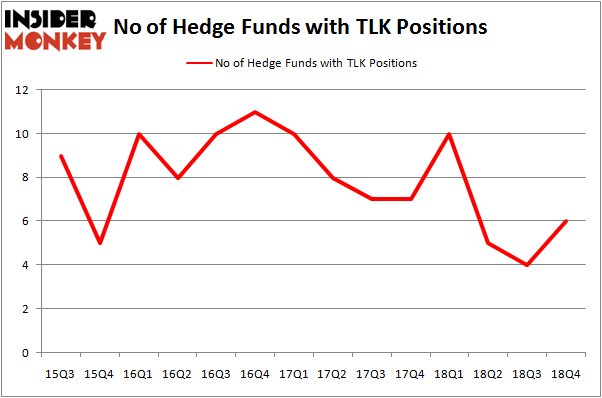 The graph below displays the number of hedge funds with bullish position in TLK over the last 14 quarters. So, let’s review which hedge funds were among the top holders of the stock and which hedge funds were making big moves. The largest stake in Perusahaan Perseroan (Persero) PT Telekomunikasi Indonesia Tbk (NYSE:TLK) was held by Renaissance Technologies, which reported holding $108.1 million worth of stock at the end of September. It was followed by D E Shaw with a $1.1 million position. Other investors bullish on the company included Citadel Investment Group, Weld Capital Management, and Fisher Asset Management. With a general bullishness amongst the heavyweights, key money managers have jumped into Perusahaan Perseroan (Persero) PT Telekomunikasi Indonesia Tbk (NYSE:TLK) headfirst. D E Shaw, managed by D. E. Shaw, established the biggest position in PT Telekomunikasi Indonesia (NYSE:TLK). D E Shaw had $1.1 million invested in the company at the end of the quarter. Ken Griffin’s Citadel Investment Group also initiated a $1 million position during the quarter. The only other fund with a brand new TLK position is Minhua Zhang’s Weld Capital Management. Let’s now review hedge fund activity in other stocks similar to Perusahaan Perseroan (Persero) PT Telekomunikasi Indonesia Tbk (NYSE:TLK). These stocks are TE Connectivity Ltd. (NYSE:TEL), Xcel Energy Inc (NASDAQ:XEL), Canadian Pacific Railway Limited (NYSE:CP), and Sirius XM Holdings Inc (NASDAQ:SIRI). This group of stocks’ market caps resemble TLK’s market cap. As you can see these stocks had an average of 26.75 hedge funds with bullish positions and the average amount invested in these stocks was $1268 million. That figure was $111 million in TLK’s case. Canadian Pacific Railway Limited (NYSE:CP) is the most popular stock in this table. On the other hand Xcel Energy Inc (NASDAQ:XEL) is the least popular one with only 21 bullish hedge fund positions. Compared to these stocks Perusahaan Perseroan (Persero) PT Telekomunikasi Indonesia Tbk (NYSE:TLK) is even less popular than XEL. Our calculations showed that top 15 most popular stocks among hedge funds returned 19.7% through March 15th and outperformed the S&P 500 ETF (SPY) by 6.6 percentage points. Unfortunately TLK wasn’t in this group. Hedge funds that bet on TLK were disappointed as the stock lost 0.2% and underperformed the market. If you are interested in investing in large cap stocks, you should check out the top 15 hedge fund stocks as 13 of these outperformed the market. Hedge Funds Dropped The Ball On Fortive Corporation (FTV) Were Hedge Funds Right About Flocking Into Sempra Energy (SRE)? Here is What Hedge Funds Think About AutoZone Inc. (AZO) Here is What Hedge Funds Think About BT Group plc (BT) Were Hedge Funds Right About Souring On Canon Inc. (NYSE:CAJ)? Is IQVIA Holdings, Inc. (IQV) A Good Stock To Buy?